Whole jalapeno peppers pickled in vinegar with onions and carrot slices. 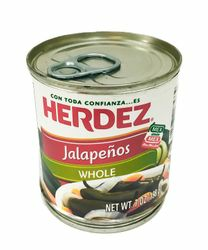 Jalape�os - The world's most flavorful chiles, constitute one of the most representative ingredients of Mexican cuisine. There are many different types of chiles, but the most popular and most used in Mexican cooking is the Jalape�o. Originally grown in Jalapa, a region in the Mexican state of Veracruz (Golf of Mexico), the popularity of this chile has grown beyond its original boundaries. The Jalape�o (a chile of the plant family Capsaicum) derives its bite or heat from capsaicun, a potent chemical that survives both the cooking and freezing processes. Jalape�os can be added to anything to spice it up. The fierceness does not detract from the flavor of food, it enhances its nuances and tastes. The Jalape�o is conical in shape, tapered at the tip, more rounded than pointed. Average measure 6-8 cm (2-3 inches) in length and 3-5 cm (1-2 inches) in diameter. Intense green color, smooth texture, thick and meaty skin, it is aromatic and has a pleasant green veggie flavor, slightly biting. The seeds and veins retain heat, removing them will make the chile slightly less hot. Jalape�os enteros en escabeche Herdez con cebollas y zanahorias rebanadas. Los Chiles Jalapenos Herdez son toda una tradici�n mexicana, ya que desde hace muchos a�os han ocupado un lugar importante en la cocina Mexicana, dotando cada platillo, cada botana y antojito mexicano con el m�s exquisito sabor. El amor y la confianza depositados dentro de cada lata y cada frasco, hacen que esta variada l�nea de productos, conquisten el paladar de quienes gustan disfrutar en cada bocado ese �nico y picosito sabor. Con toda confianza..... es Herdez. Excellent flavour & texture, both the jalapes enteros y las Rajas.